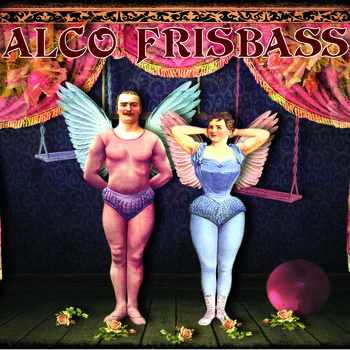 The mesmerizing opening track “La Suspension Ethéréene” contains many textural keyboard hallmarks reminiscent of the classic mid-70s zeuhl sound, yet there are no voices, and it also breathes an equal abundance of symphonic and jazz elements, making this debut album by French duo Alco Frisbass a very original endeavor. Just when one thinks it might be going in one direction, everything changes and suddenly they are somewhere else entirely. Fabrice “Chfab” Chouette plays keyboards, guitar, recorder, voice, whistling, and percussion, while Patrick “Paskinel” Dufour plays Fender Rhodes, additional keyboards, percussion, and drum programming, so keyboards are an essential and prominent element of their instrumental mix, but not overpowering. The guest list includes guitarist Jacob Holm Lupo (White Willow) on that opening track, and on the closer “Judith Coupouse la Tête,” which also includes some additional keyboard and Mellotron work by Thierry Payssan (Minimum Vital). Archimede De Martini (Stormy Six) contributes several outstanding violin solos throughout, including on the opener. Some wordless voices show up in one part of the third cut “Induction Magnetique,” and again on a couple parts of the twelve-minute “Escamotage,” but apart from that the entirety of the six long cuts (four break the nine-minute mark) are instrumentals that a listener can get completely lost within. The mixing is handled by Paolo “Ske” Botta (Yugen, Not a Good Sign) and mastering was done by Udi Koomran, and whether one listens to this on cheap computer speakers or on high end headphones or anything in between, this sounds great beginning to end. The label’s infosheet made a big deal about this album being “...pure Canterbury sound,” and I suppose there is some validity to that due to the extensive use of Fender Rhodes, but to my ears this sounds very French, with some passing salutes to some great bands of yesteryear like Eskaton, Transit Express, and others, but more than anything Alco Frisbass have created their own special musical world.